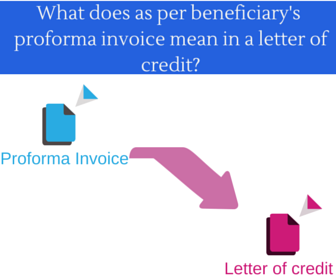 What does "as per beneficiary's proforma invoice" mean in a letter of credit? Almost all letters of credit, at least the ones that I have encountered with, contain a phrase under field 45-A Description of Goods, giving express reference to a proforma invoice. Commercial invoice must be bearing this clause: ''We certify that invoices are in all respects correct and true both with regard to the price and description of goods referred to therein and as per proforma invoice no.011 dated 09/06/2014." Commercial invoice must state that as per beneficiary's proforma invoice ref no:AA130522 dd:04.07.2014. As per applicant's purchase order no. d14080 dtd 17.12.14. But what does an express reference to a proforma invoice mean in a letter of credit? 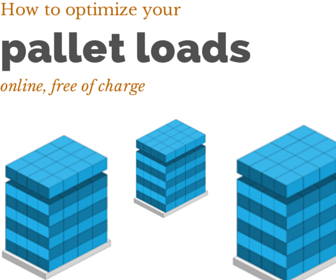 How to present a correct invoice in such a situation? What does an express reference to proforma invoice mean in a letter of credit transaction? Some exporters believe that they have to state the express reference on the commercial invoice as it was indicated in the letter of credit, then they have to write down description of goods exactly as it is seen on the proforma invoice. But this is a wrong knowledge or assumption, whichever you choose. According to letter of credit rules, UCP 600, commercial invoice should show exact description of goods indicated in the letter of credit. Commercial invoice cannot mention additional items, which have not been defined in the letter of credit, even if they are free of charge. AS PER APPLICANT'S PURCHASE ORDER NO. D14080 DTD 07.05.14. 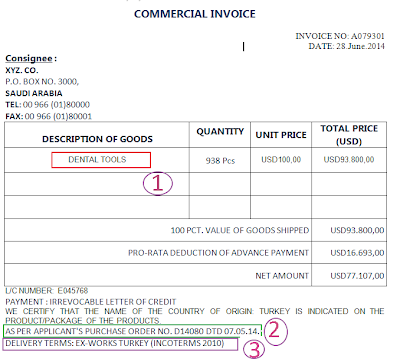 Description of goods written on the commercial invoice as it was indicated in the letter of credit. What was written on the proforma invoice is not our concern as an exporter. On the above sample description of goods is "Dental Tools"
Quick reference to proforma invoice has been copied to the commercial invoice as it is seen in the letter of credit. "AS PER APPLICANT'S PURCHASE ORDER NO. D14080 DTD 07.05.14. " Finally delivery term has been mentioned on the commercial invoice as it is mentioned in the letter of credit. 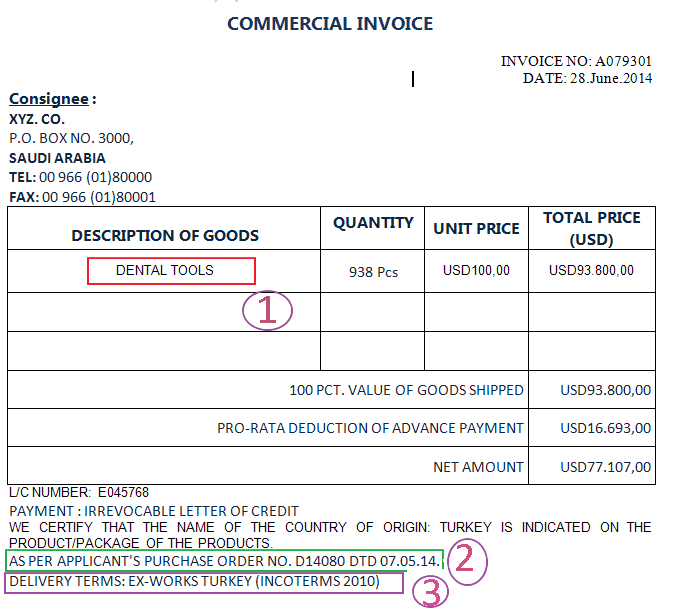 "EX-WORKS TURKEY (INCOTERMS 2010)"